Graffito is all over the world. The earliest forms are found on rocks, and in caves. 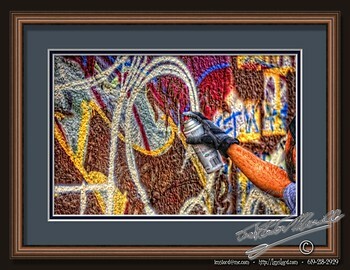 All graffiti are put in their places by the hands of humans. What do they, the creators, see? What do they see when they spit colors across their hands placed on the wall of a cave when they move their hands away and see the void in the color where their hands were just moments ago? Do they look into the future and see the shadows of their descendants looking backwards through time, with the imagination to see into the eyes of the human creator? Do they exchange quantum moments of entanglement? I hope so. It is what I see. It is what I strive for in my photos. This entry was posted in Artists, Building Exteriors, Man, Painterly, Purchasable, Purchasable - As Art Prints. Bookmark the permalink.